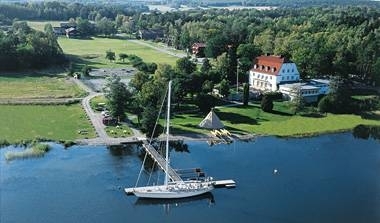 The second annual meeting of SeRC will be held 10-11th of May at Tammsvik. The invitation can be downloaded here and the final program can be downloaded here. Go with the KTH bus transport to Tammsvik. The bus leaves from Lindstedtsvägen 1 at KTH Campus. The buss will depart at 10.45 to Tammsvik the 10 of May. The bus will also return from Tammsvik the 11 of May and will depart from Tammsvik at 14.00. Free of charge. Estimated travel time 50 min. Take Arlanda Express train to Stockholm C. Take the subway T14 to KTH (Station Tekniska högskolan). Go with the KTH bus transport to Tammsvik. Cost about 33.15. EUR. Estimated travel time 1 h and 20 min. Take bus UL 803 from Arlanda Airport to Bålsta C. Take a taxi from Bålsta C to Tammsvik. Cost about 34.87 EUR. Estimated travel time 1 h and 15 min. Take a taxi from Arlanda Airport to Tammsvik. Cost about 69.75 EUR. Estimated travel time 40 min. Take flygbussarna (Airport Coaches) to Stockholm C. Take the subway T14 to KTH (Station Tekniska högskolan). Go with the KTH bus transport to Tammsvik. Cost about 18.11 EUR. Estimated travel time 2 h and 30 min. Take flygbussarna (Airport coaches) to Stockholm C. Take train J 35 to Bro (Upplands-Bro) train station. Take a taxi to Tammsvik. Cost about 40.40 EUR. Estimated travel time 2 h and 10 min. Take flygbussarna (Airport coaches) to Stockholm C. Take a taxi from Stockholms Central till Tammsvik. Cost about 103.13 EUR. Estimated travel time 2 h and 10 min. Take a taxi from Skavsta Airport to Tammsvik. Cost about 193.96 EUR. Estimated travel time 2 h.
Take flygbussarna (Airport Coaches) to Stockholm C. Take the subway T14 to KTH (Station Tekniska högskolan). C Cost about 18.11 EUR. Take bus 152 from Bromma Airport to Sundbybergs Torg. Take train J 35 to Bro (Upplands-Bro) train station. Take a taxi to Tammsvik. Cost about 29 EUR. Estimated travel time 1 h and 30 min. Take a taxi from Bromma Airport to Tammsvik. Cost about 64.15 EUR. Estimated travel time 45 min. Take the subway T14 to KTH (Station Tekniska högskolan). Go with the KTH bus transport to Tammsvik. Cost about 3.21 EUR. Estimated travel time 1 h.
Take train J 35 to Bro (Upplands-Bro) train station. Take a taxi to Tammsvik. Cost about 25,79 EUR. Estimated travel time 45 min. Take a taxi from Stockholm Central Station to Tammsvik. Cost about 64.12 EUR. Estimated travel time 50 min. If you pre-order a taxi in Tammsviks reception you receive a considerable discount. This applies both to and from Tammsvik. Airport buses recommend that you go from Stockholm Central station at least three hours before departure when you travel from Skavsta Airport. The estimated travel times do not take into account the waiting time for changing modes. Show Tammsvik on a larger map.